In late August 2011, Vermonters felt the 5.8 magnitude earthquake centered in Virginia. Earthquakes are rare in Vermont, so that was a bit of a novelty. A few days after the earthquake we experienced the tail of Hurricane Irene, which was “merely” a tropical storm by the time it arrived. We expected some wind and rain, and maybe some power outages. Yet Vermont’s topography meant we suffered as much as if our state were oceanfront property. The several inches of rain that fell in southern and central counties funneled down mountainsides to our small streams. Even our largest rivers quickly reached flood stage. The damage was quick, devastating, and unexpected by most. Emergency workers quickly mobilized; communities rallied. Eventually all the state’s roads reopened, but it took months before the hardest hit areas were accessible again. Villages continue to struggle as businesses attempt to reopen after navigating the mazes of insurance coverage and the intricacies of claims for flood damage in areas where flooding seemed all but impossible. Families mourn not only lost real estate and personal possessions, but irreplaceable heirlooms. We all do what we know best. 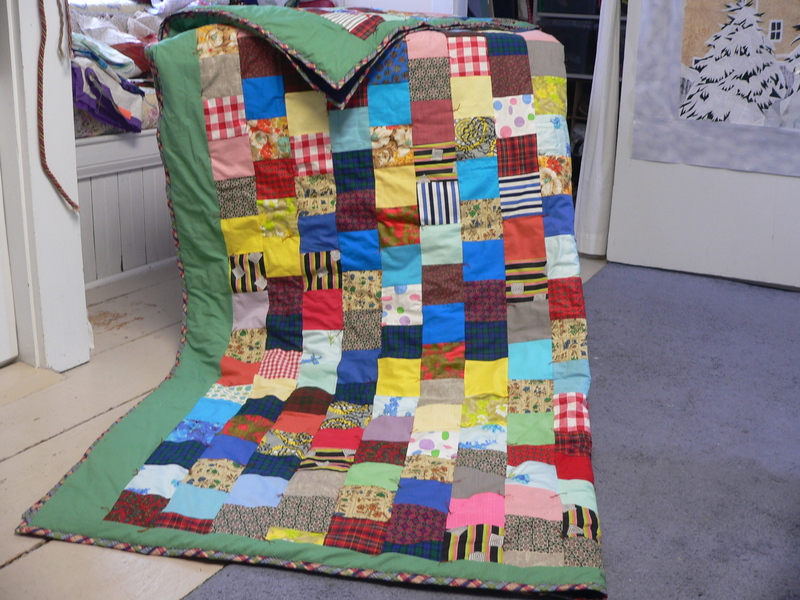 Pam Druhen, an enterprising quilt artist, spearheaded the Winter Warmth Project shortly after this disaster unfolded. I’d recently discovered the “postcard” quilt that I started as a Girl Scout, so I donated that to Pam’s call for unfinished quilt tops knowing that it was unlikely I’d get a bed sized quilt top completed anytime soon. A perch no longer fit for the Studio Prince! The young prince, Studio Pup, has his nose out of joint these days. For years he’s been able to lounge on the hand-me-down sofa in a corner of my studio, one of the few places that he can stare out the window and doze in the afternoon sun. But my productivity and organizational system enhancements this year have ruined his royal lifestyle. For months now I’ve chipped away at the “project” of enhancing certain aspects of my studio that I’d been tolerating, like the broken keyboard tray on my otherwise wonderful computer workstation. And then came the loveseat. It was the perfect size, and great quality. The upholstery however was once nice . 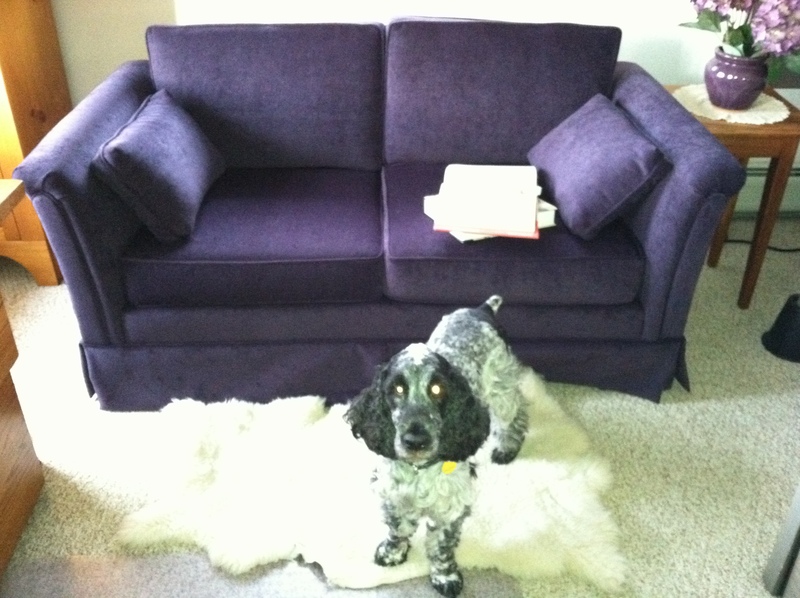 . . “back in the day.” A trip to the local home decorating store, a few weeks of patience, and more than a little cash and now I have a nearly new loveseat in a beautiful deep-eggplant color to complement the valances made by my dear friend Jan.
Fortunately the Studio Pup is well-behaved, and understands the words “no, not for dogs . . .” He is sure that I’ve lost my mind however, given that it really is the same loveseat in the same place that now he’s no longer welcome to use. So this is why I’ll be spending the afternoon sewing a new dog bed rather than doing something artistic! 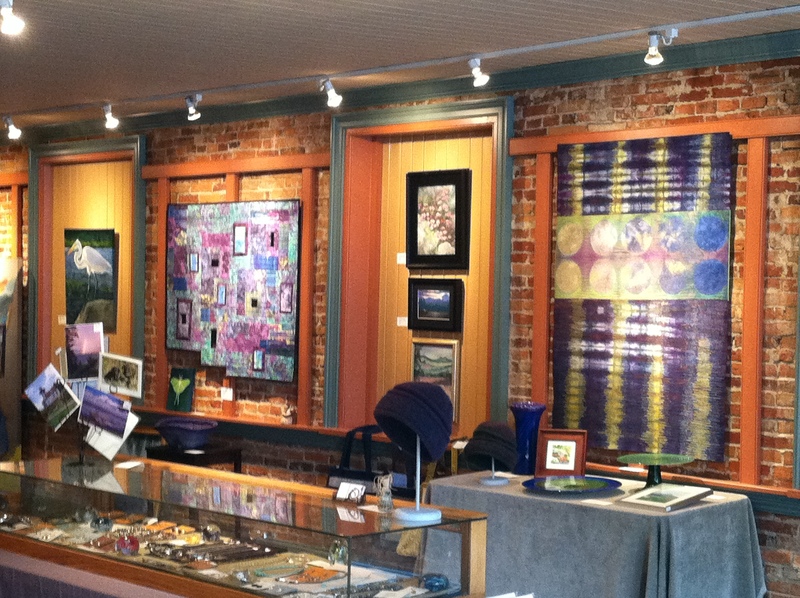 The Flights of Fiber Fantasies exhibit has now been hung at Creative Space Gallery – and what a sight! 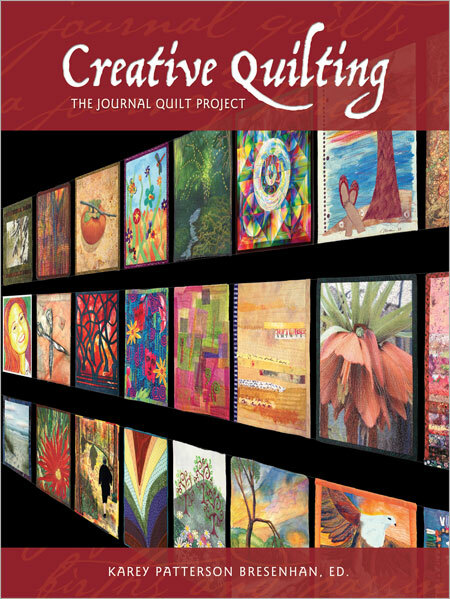 I’m thrilled to join fellow art quilters Marilyn Gillis, Pamela Druhen, and Elizabeth Fram in this exhibit. 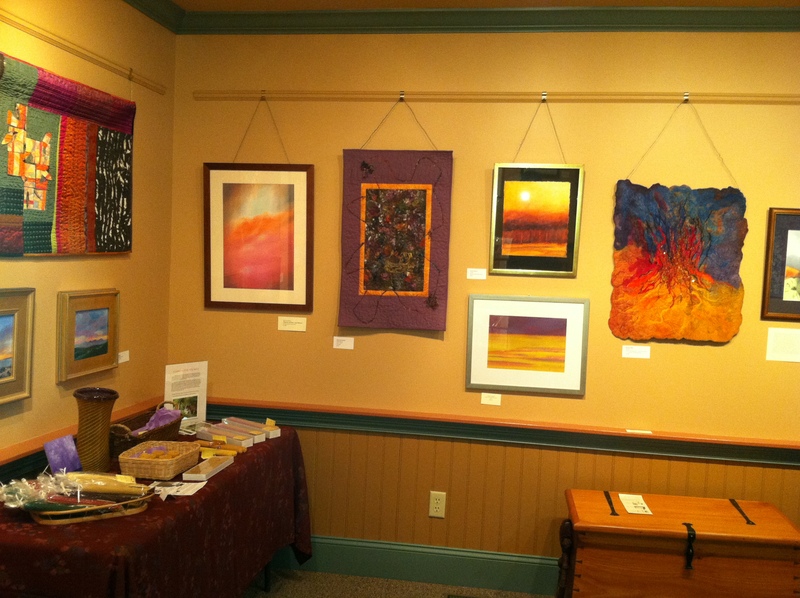 Our fiber art is beautifully complemented by contemporary baskets by Tamara Wight, exquisite felt by Marsha Chase, and gorgeous paintings and prints by member artists. 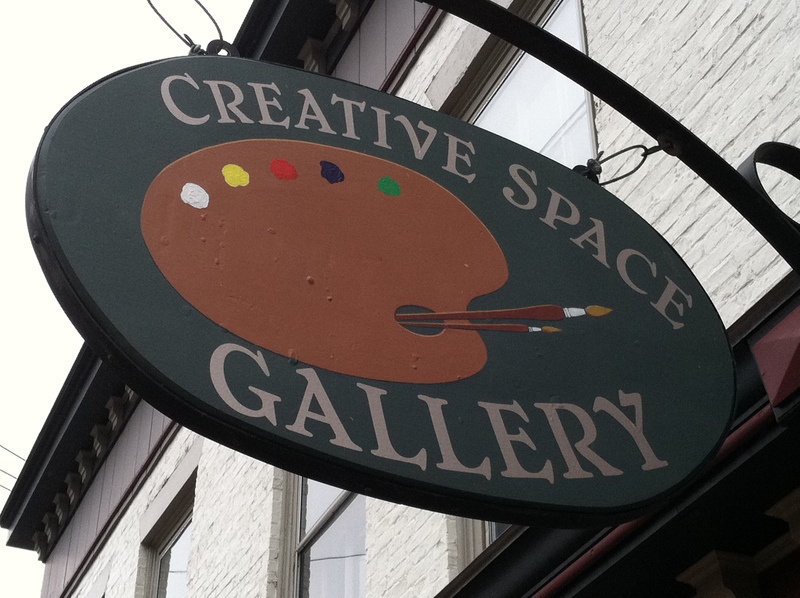 The Gallery is open Thursday – Sundays, and is a stop on the Foliage Open Studio weekend sponsored by the Vermont Craft Council. 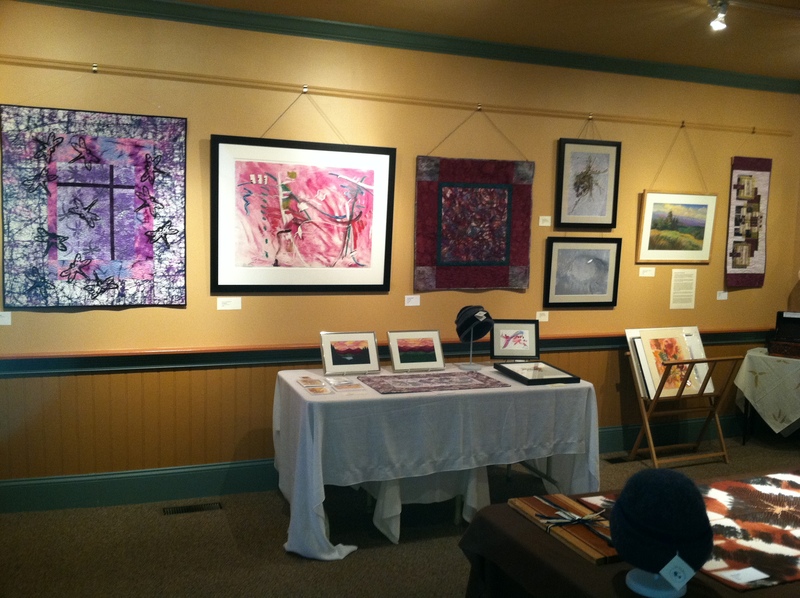 Flights of Fiber Fantasy will be on display through November 5th – if your fall foliage travels include the Champlain Valley of Vermont, please drop by! 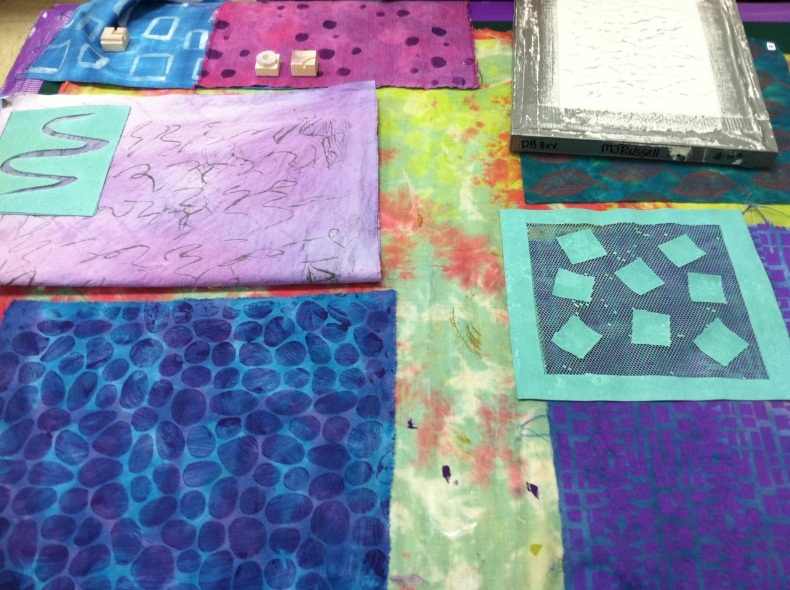 Vermont is certainly lucky to have a spirited and energetic Surface Design Association Rep. Under Karen Henderson’s leadership, and with the generous sponsorship of the Rae Harrell Gallery, we just concluded a wonderful exhibit featuring a variety of works by our talented members. 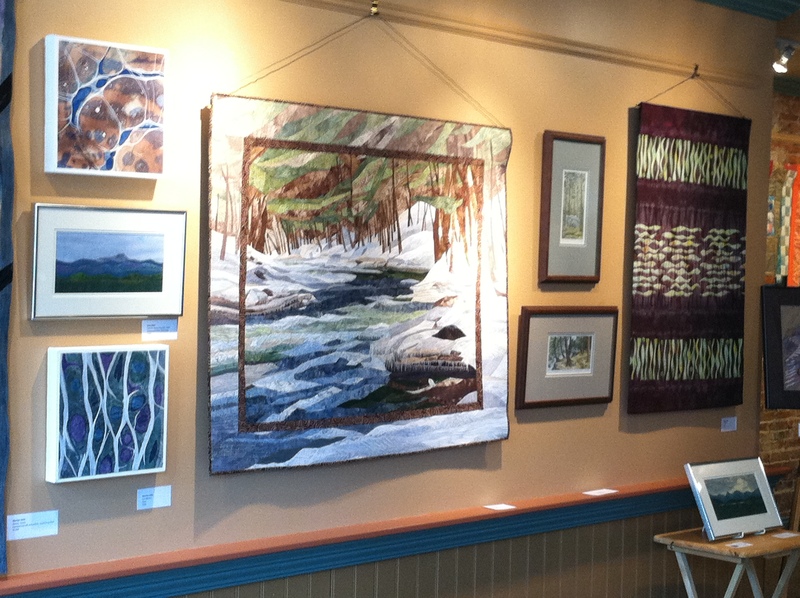 Rug hooking, weaving, collage, knitting, art quilts and more adorned the walls of Rae’s beautiful gallery for six weeks in late summer. The turnout was impressive at both our opening night and the artist’s walk through a few weeks later, and both evenings were highlighted by sales of our members’ artwork. 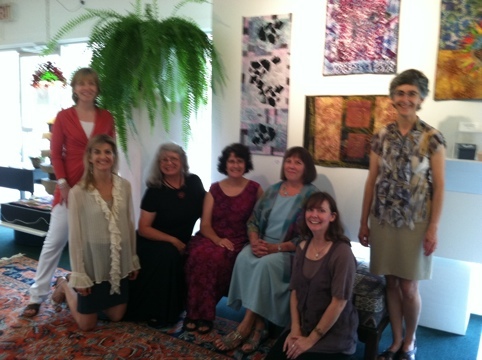 Members of the SDA’s Vermont chapter pause before the exhibit opening in August. Pictured are Betsy Fram, Hillary Harrell, Rae Harrell, MJ Russell, Judy Dales, Karen Henderson and Eve Jacobs-Carnahan. 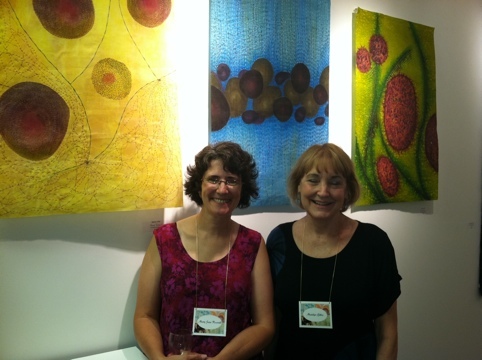 MJ Russell and Marilyn Gillis with some of Marilyn’s recent works. 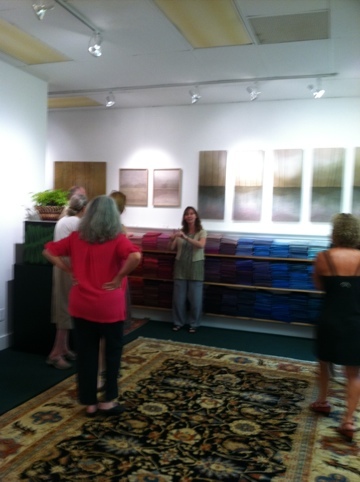 Karen Henderson speaks about her work during the Artist’s Walk-through — note also Rae’s beautiful stash of hand-dyed wool for rug-hooking. 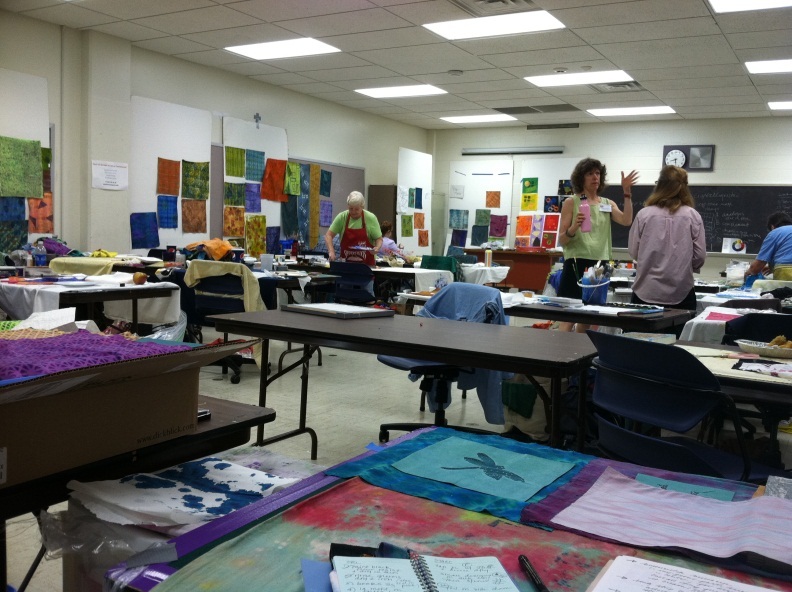 There’s no lake at the mid-summer “Quilting by the Lake” conference in upstate New York – at least not since its early days at another college campus. 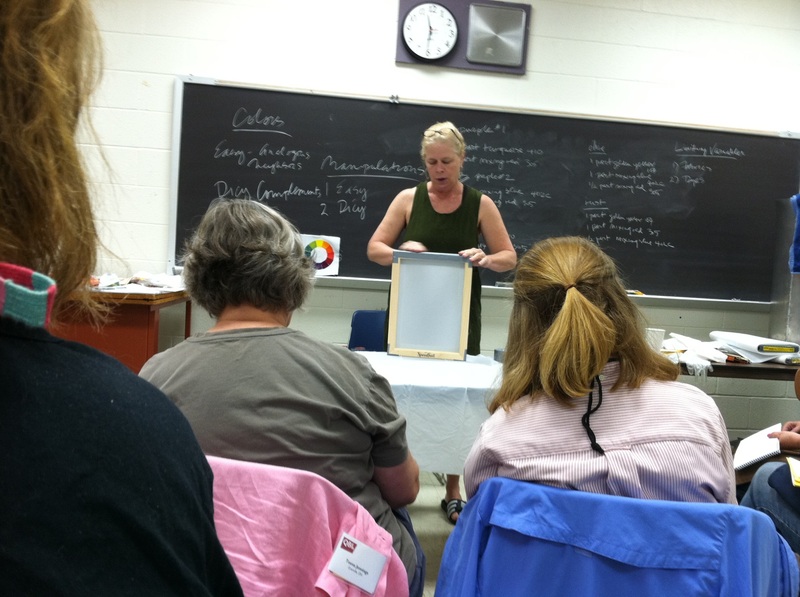 And despite spending a week at a quilting conference, I actually did not bring my sewing machine! 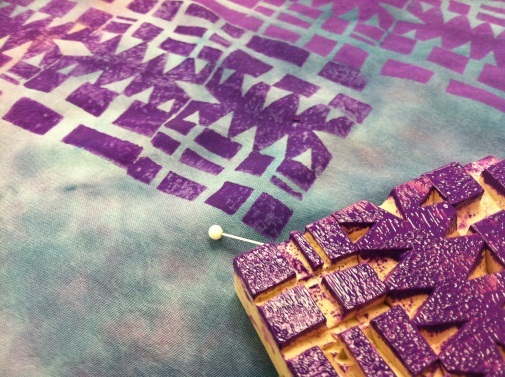 I enjoyed my week of surface design exploration with Jane Dunnewold tremendously however. 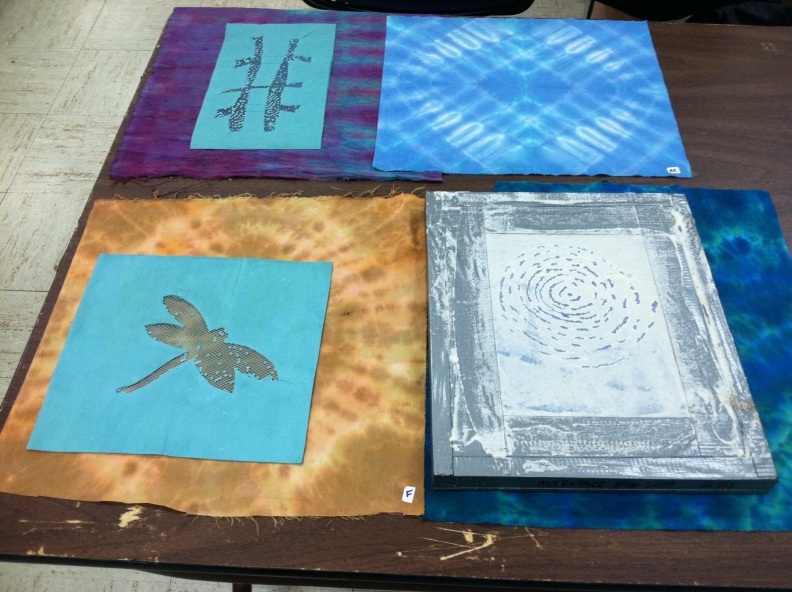 I’d heard Jane speak at the International Quilt Festival in Houston and had participated in several of her lectures and demos there. 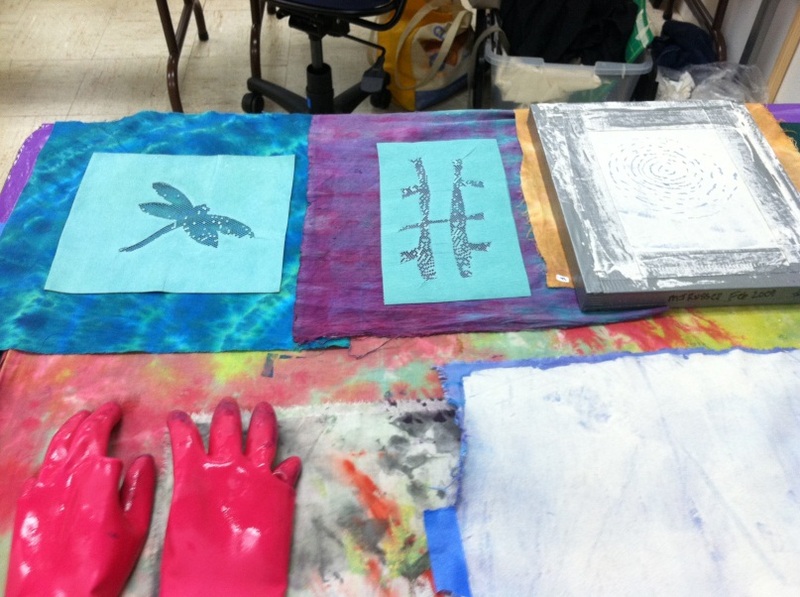 But there’s no substitute for getting your hands dirty during a week of surface design. Actually, there’s no excuse for that either! Jane is appropriately diligent about studio safety practices and made sure that we did not end the day with dye-stained hands. The light winds and 90+ temperatures dried our fabrics quickly in between steps, while the cicadas hummed in the trees and we enjoyed our spacious air-conditioned studios. I’ll have to confess that I use most of the techniques in my work already, but the flour paste resists were a great discovery and could be the technique to get past a stumbling block in a series I’ve long considered but never started for lack of the “right” fabrics. MJRussell_Jan2011_Highly Prized | Flickr – Photo Sharing!. January is a month for catching up . . . and branching out! This year I’m experimenting with new media as well as textiles, but of course can’t resist integrating some of my previous artwork in new ways. I’m a member of The Sketchbook Challenge, where January’s theme was “highly prized.” Here I’ve collaged a digital image of my puppy (which I’ve also used in the past as a photo emulsion silk-screen) over a background of gesso and acrylic paints and highlighted with wax crayon, art pens, & markers. As you can tell from the journal text, he was a bit of a wild child! Do check out the Flickr site for The Sketchbook Challenge to see hundreds of images from other members of the group!